Malcolm Gladwell made famous the natural human reaction of judging other people in the first few minutes of an encounter with his book, Blink. Like many other businesspeople, VCs and angel investors (“investors” going forward) blink and judge entrepreneurs very quickly in the first few minutes of an interaction. That’s why the way an entrepreneur starts an investor pitch meeting is a key determinant of their success in that meeting. Those first 10-15 minutes, where the entrepreneur presents themselves before they even present the idea, are very critical in establishing credibility and the right to continue to pitch to an engaged audience. Yet, it is amazing to me how few entrepreneurs start investor meetings crisply and confidently. The formula for the start of the meeting is almost always the same – you are trying to answer the simple question on the mind of the investors: who are you and why are you here? But when asked to review their backgrounds, entrepreneurs often fumble through incoherently, or ramble on tangents that aren’t relevant to the situation. So, how should you start an investor meeting? It’s as simple as ABC: Always Be Credible. Investors are looking for credibility – can we trust that you have a uniquely good idea or insight, are you capable of executing on it, and are you the real deal or full of bluster and BS? Be genuine and personable – Let your personality show, professionally of course. At some point in the introduction, say something that makes you smile, which will make those around you smile. If you don’t engage your audience, they’ll jump to their Blackberries. For example, ZestCash CEO/co-founder Douglas Merrill is a charming character and, even putting aside the shoulder-length hair and tattoos, you can’t help smile when he introduces his background (raised dyslexic in Arkansas, followed an unlikely path of earning a Princeton PhD, leading Google engineering and IPO in his role as CIO for 5 years, and now has developed a vision to transform short-term consumer credit by blending online data with traditional underwriting techniques). Be crisp and on point – The most compelling background speeches are crisp, straightforward and very demonstrate relevant links to the opportunity at hand. For example, SaveWave CEO/co-founder Dave Rochon gave the following brief narrative when pitching investors: “I worked at Catalina Marketing for 10 years in sales and launched their Internet couponing business, then joined Upromise the year it was founded and built the grocery business for 10 years, serving for three years as president after the acquisition by Sallie Mae. I now want to transform the online and mobile grocery coupon business.” Dave’s Series A round was way over-subscribed by folks like First Round, Ron Conway, Roger Ehrenberg, Founder Collective and I think it’s in no small part because his background and delivery were so crisp and relevant. Keep it short. I find that the more impressive the entrepreneur, the shorter the introduction. The worst situation – 20 minutes into the presentation, the entrepreneur is still bragging about some random product they launched in a completely irrelevant industry sector. The VCs are already hitting their Blackberries and wondering how they can end the meeting gracefully. And you run out of time to actually pitch the big idea. Meandering introductions are the death of a pitch. Do not exaggerate. Assume that everything you say will be thoroughly checked out in due diligence. If you claim credit for a company where you played a small role, it is bad form. I recently called the CEO of a company that an entrepreneur bragged they had led during the pitch. When the CEO told me they were a minor player and left after a brief two years, I stopped spending any more time evaluating the opportunity. Remember, investors are professional BS detectors. Err on the side of underselling your background because the BS alarm bells may ring in the first few minutes of introduction and spoil the rest of the presentation. There’s no “I” in team. When entrepreneurs talk about themselves in grandiose terms in their introductions, it’s usually a sign of egotism. When entrepreneurs talk about the teams they built and the smart people that somehow they were able to convince to join them in their cause, it’s a sign of great leadership. Guess which of these two profiles investors are more attracted to? Don’t name drop. Some investors are notorious name droppers, so this is a bit of the pot calling the kettle black, but investors get very turned off when the entrepreneurs name drop in their introductions. We don’t need to hear every famous person you’ve met or pitched or worked with. Establishing a few common points of contact is a good thing. Acting like you are best friends with folks who wouldn’t recognize you if you bumped into them in the grocery store on a Sunday afternoon is not recommended. Remember, be credible, humble and specific and you’ll do fine. Take the 5-10 minutes time to establish that initial credibility, and then move on. Investors like to back great people, so spend as much time thinking about how to present yourself in a compelling fashion as you would your idea. My, What A Big Balance Sheet You Have! 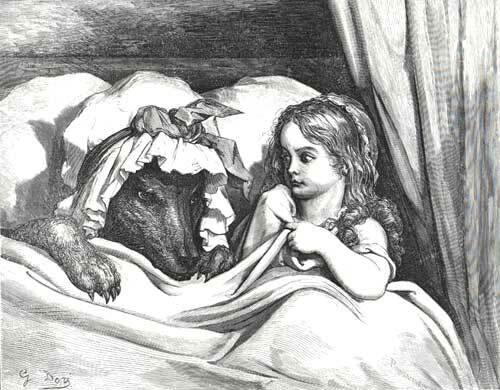 In undiluted tellings of the tale, the Big Bad Wolf devours Little Red Riding Hood before running off into the woods. It’s worth remembering when considering the prospects for a wave of technology M&A to materialize. Over the last few months, investment bankers have been eagerly reaching out to corporate buyers at the large public technology companies, as their burgeoning balance sheets have grown large enough to cause even a sangfroid, buttoned-down banker to salivate. The eight US-based technology companies with market capitalizations of over $100 billion (Apple, Microsoft, Google, IBM, Oracle, Cisco, Intel and HP) are sitting on over $200 billion in cash and short-term investments. Throw in the top three healthcare firms by market capitalization (J&J, Pfizer and Amgen) and the figure is $250 billion. Further, each of these companies is in a strong competitive position, competing in markets with positive secular trends thanks to the burst of innovation that is ahead of us. I can’t cite another time in the brief 50 years history of the technology industry when so many US-based companies were in such strong global leadership positions in so many compelling, growing markets. With the economy modestly rebounding and fear beginning to seep out of the market-–the VIX index, a measurement of market volatility or fear, is down to as low as it was in summer of 2008–-it’s no wonder that many are forecasting a robust pick- up in M&A activity in the coming year. Private investors have held on to their good companies over the last two years when it was purely a buyer’s market. Meanwhile, large companies who have spent the last two years cutting costs and pushing for efficiencies are now eyeing growth. And the quickest way to grow? Buy it. That said, private companies should be careful not to get too euphoric. A quick survey of my investment banker friends yields comments like, “a flight to quality”–-in other words, rational deals with market leaders get done, but unloading mediocre companies is not in the cards–-and “patience” or “inconsistent interest.” One banker reported to me that one or two buyers are at the table on deals that are getting done, not three or four. Further, no one appears to be in a rush. Strategic fit is being carefully analyzed and only top priority opportunities are being pursued. So despite the fact that yields on cash are at a historic low, don’t expect those balance sheets to thin out anytime soon. And Little Red Riding Hood should still be very, very afraid. Can VCs Be Value Investors? Security Analysis is cited by Warren Buffet as one of his top four favorite and most influential books. Written by Columbia University Professors Benjamin Graham and David Dodd, it was first published in 1934. The book is a thick tome that articulates the thesis of value investing – the analytical techniques for valuing securities and seeking to invest in those securities in the context of their underlying value. The latest printing, the sixth edition, contains a foreword from the Oracle of Omaha himself as well as a preface from hedge fund investor Seth Klarman of The Baupost Group, who is regarded by many to be one of the modern masters in the art of value investing. As a venture capitalist reading the book and trying to absorb its investment lessons, I wondered – can VCs be value investors? After all, the philosophy of value investing, in theory, should cut across all asset classes and managers. The precepts and principals therefore should apply to the venture capital business as well. Unfortunately, VCs don’t operate with a margin of safety, even if they are able to find and negotiate good deals. Later stage investors may have downside protection if they buy smart, but early-stage VCs do not. If a portfolio company goes bad, there is typically barely any salvage value. There is a see saw debate often heard in the hallways of VC firms – does success come from being a good stock-picker or company-builder? In other words, will a VC generate strong returns because they are good at finding the best companies and entrepreneurs to invest in, or will the returns be generated by adding value to companies through shrewd strategic guidance and savvy recruiting and team-building? The answer appears to be both, but even the debate itself is also framed incorrectly, I would argue. Entrepreneurship is all about people. The VC business has evolved into a world where the challenge is less about choosing the best entrepreneurs to invest in, bur rather convincing the best entrepreneurs to take your money. This dynamic is unique as compared to other asset classes. Imagine a world where the highest quality forests choose which endowment they’d like as their owner; or a public stock chooses which hedge fund they want to own 10% of their outstanding stock. Sounds ridiculous? That’s precisely what is happening when VCs compete with each other and chase after the best entrepreneurs, offering entrepreneur-friendly terms, supportive advice and value-add. That’s why, in the end, the VC business is still a blend of art and science. It is part financial asset class, part creative entrepreneurial endeavor. And, under any analysis, is not for the faint of heart.